How to puzzles support learning in the classroom? Word search puzzles are a great tool for educators to introduce new concepts and help consolidate vocabulary. This Valentine's Day themed word search puzzle has a list of words with letters scrambled. To solve the puzzle students need to unjumble the letters, and then locate the words hidden in the grid. 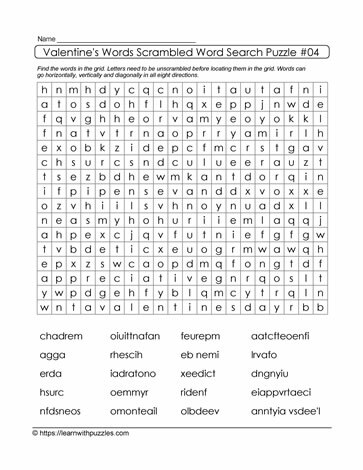 Puzzles, like this scrambled word search puzzle, support students' vocabulary building skills, problem solving skills, as well as providing an opportunity to enrich the classroom through cooperation and collaboration with others.